Updated 2/20: Shows scheduled for Under St. Marks will now be at the IATI Theater at 64 E. Fourth St. The annual Frigid Festival gets underway on Wednesday at several East Village venues. 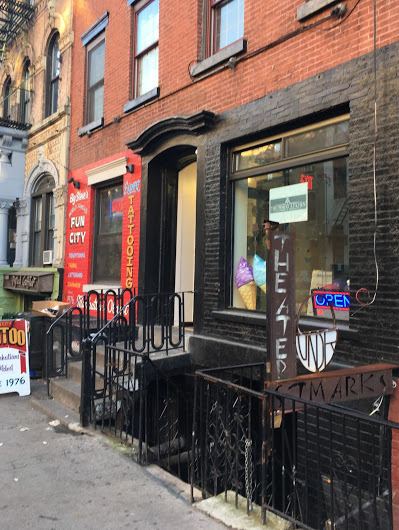 Unfortunately, Erez Ziv, Frigid's artistic director, has learned that one of the main venues for Frigid, Under St. Marks, 94 St. Mark's Place between Avenue A and First Avenue, isn't available now. Under St. Marks has operated here as an experimental theater space since the 1970s. Under St. Marks is currently operated by the Horse Trade Theater Group. Meanwhile, there aren't any new work permits on file with the city for 94 St. Mark's Place that might shed light on the scope of work necessary in the basement space.